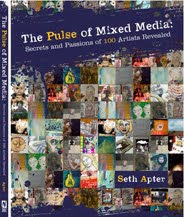 My collage paintings, including the one above, are included in this book (below). The book offers a broad scope and array of the many collage artists out there working today. I have chosen just a few of the artists featured in the book along with one of their quotes. 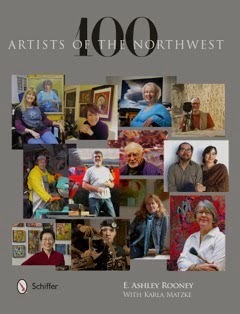 There were so many wonderful artists to choose from, that I highly recommend the book. 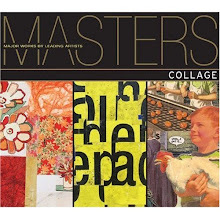 MASTERS COLLAGE: Major Works by Leading Artists by Lark Publishing will be available soon at Amazon.com and bookstores. 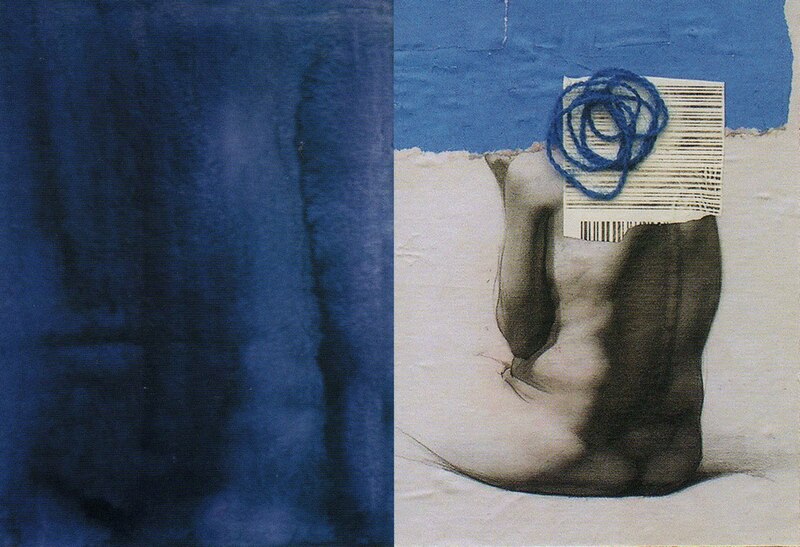 40 collage artists are featured in the book, with their collages and quotes about their process and philosophy. There is a wide range of styles, and viewpoints. Randel Plowman: "Without a doubt, collagists do more than just glue items onto paper. 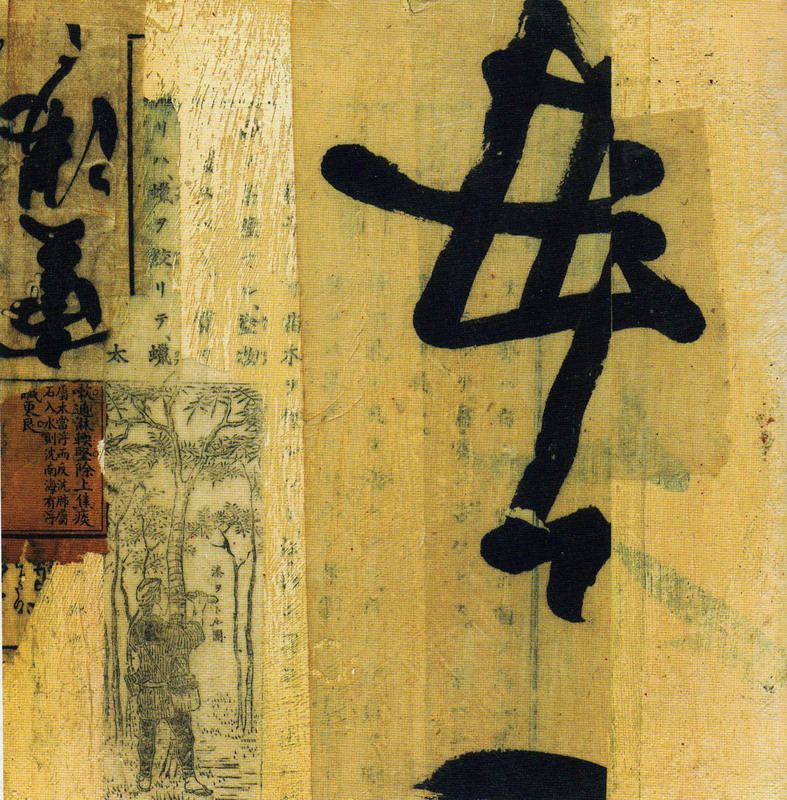 The best collage artists have strong composition skills, a definite sensibility regarding the use of materials, and an innovative approach to the organization of visual components...I chose forty collagists, each of whom has a unique perspective and brings something different to the craft." 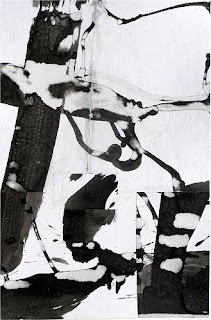 Randel is the curator and chose the collage artists for this book. You can find his collage a day at his blog here. You can find more of his collages at his website here. 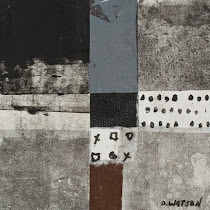 Dennis Parlante: "I use old papers, postal envelopes, stamps, and antique materials of all kinds. My goal is to go beyond nostalgia without sacrificing the unique power of these vintage materials." 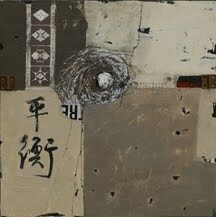 Dennis combines Asian simplicity with line and mark making and you can find so much more of his wonderful collages at his website here. Liz Cohn: "I love using old papers and scraps of recycled material, because I think they give my work a subtle historical richness." 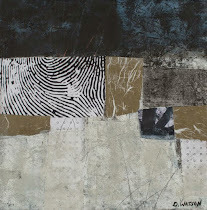 Liz has many more collages on view at her wonderful website here. 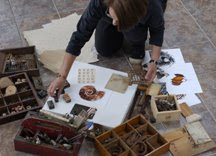 Janet Jones: "I always work in a series, with several related pieces on my worktable at once. This allows me to develop a single theme from different aspects. It also keeps me from trying to put everything I know into one piece." Janet has a fabulous website with much more art works to be discovered here. 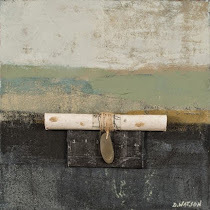 Stephanie Dalton Cowan: "Each of my pieces is the result of an organic unfolding--a development that yields unexpected discoveries and narratives about our inner and outer worlds." 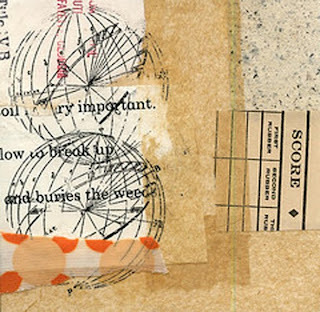 She has a website with more of her collages which can be found here. 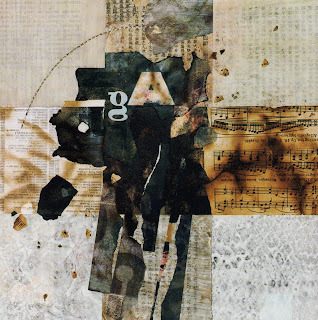 Mariella Bisson: "My work is a dance between collage and painting, as I glue hundreds of paper scraps into position. I use small flickering fragments of paper to communicate the effects of sunlight and moving shadows." 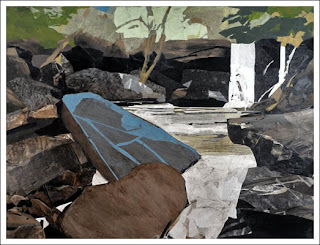 She has a great website filled with much more of her large scale collages found here. Note: this piece is 38"x50". 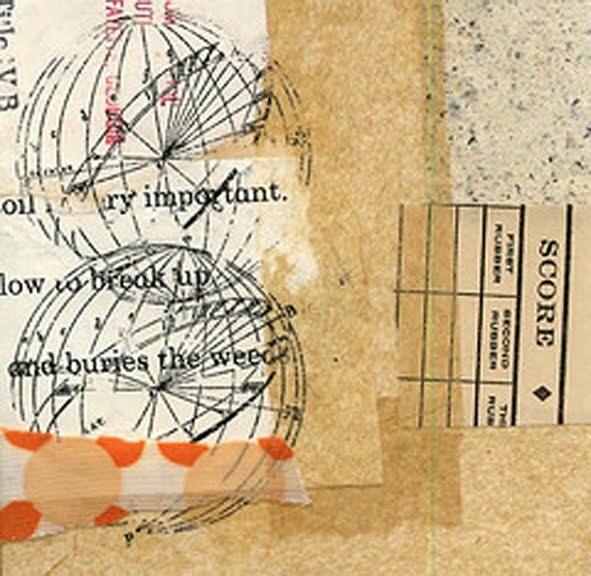 Kim Printz: "I love to randomly grab a book or a stack of papers that I can cut up, then try to make a collage in 10 minutes. I did this every day for a couple of years, and I think it helped me develop as an artist." Kim has a wonderful blog called paperwerks which you can find here. 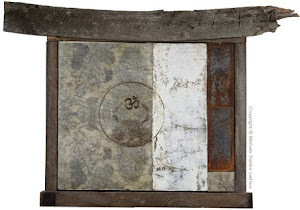 Cecil Touchon: "The poetry that I address in my work is visual and concrete. 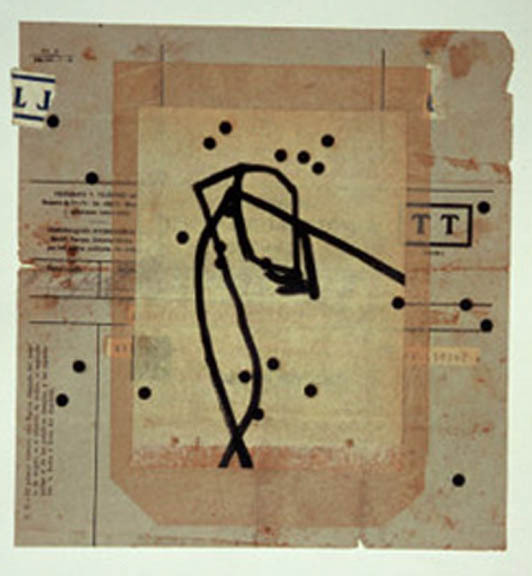 It isn't a poetry of words, but one that deals with the foundations of written language--the typography and space, color and surface of language." You can find more of his work at his website here. What a veritable feast of images you've provided here. I will have a field day this evening visiting their sites and blogs! The artists you've selected are diverse in their styles and yet all incredibly skilled in composition and their use of materials. Congrats on your inclusion in this sourcebook and thank you for the rich food for thought and inspiration. Congratulations, Donna! It's so cool that your wonderful work is in this book! Thanks for introducing these other great artists to us; I'm intrigued by each and every one of them, and can't wait to buy the book! Coincidentally, Randel Plowman lives near me, in northern Kentucky. I don't know him, but I follow his blog. Well, I guess there's another book on my list of books to buy! Thanks for the great pictures showing the work. 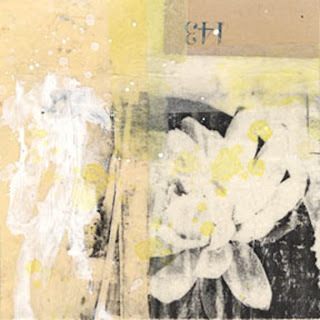 I went to Line Juhl Hansen's site and ordered one of her prints. It arrived today and I love it! Thanks for the recommendation Donna! oh, donna, thank you. what a wonderful collection of art. i feel so humbled and honored. amazing work! Thanks again for introducing new artists to me and for those delicious clickable links! Exciting that you are included here but no surprise, your work is exquisite. Congrats to you! Wow, thank you for sharing a glimpse into these pages and the artists included - each and every one is wonderful! Congratulations on being included, it looks like a beautiful book. It is a great accomplishment to be included in this book of collage masters Donna. Thanks for the inside peek and the links to the artists. I was only just making a list of collage books to get from Amazon so I will keep an eye out for this one too. A Lovely post again...yours are always so informative and elegant in style and presentation. 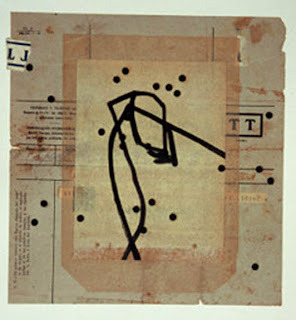 Some interesting links and collage work. Re-using old materials is something I continue to look into, and hopefully master at some point. I just ordered the book! I am thrilled your in it! I can't wait! What a treat to know your in the book! Sooo inspirational! congratulations. what an honor to be included in this beautiful book. thank you for the intros to some of the other artist too. I shall feast on these links throughout the day. your post a gift perfect for me right now....thank you. Donna this is a wonderful post and I am sure to buy the book. What a weatlth of beauty and knowledge shared. I am hesitant in collage and think I am going to adopt two of the techniques mentioned by artists here: a 10 minute approach for spontaneity and instinct, and the working on several pieces at a time. i can relate to the wanting to put everything together in one piece attitude ;-) Fabulous and thanks heaps. Your work is wonderful, Donna. No wonder it is included in this book. Thanks for sharing your work and some of the others included. My hubby is leaving for a business trip next week for 8 days. When he goes out of town he buys me books. This has been on my wish list and now that I have seen some of what it contains, I'm purchasing it immediately. Thanks for the sampling. Looking forward to seeing your work in print (of course, in person would be best). well of course I will have to have this book because YOU are published in it! your piece is wonderful and I love that you always share your spotlight with the others!! you are so very generous! and that generosity shows in your work as well, it is full bodied and rich! congrats!! Congratulations, the inclusion of your collage in this new book is justly deserved. The great array of contacts will give me many hours of happy browsing. Thank you. 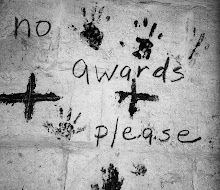 Congratulations...no surprise...your piece is outstanding as the others. Thanks for the introduction and the links. This is a book to keep...timeless. Congratulations on having your collages published in this great book, it is soo deserved! I already noticed the book in Montana and will surely purchase it, it looks so inspiring and informative. What a marvelous book - and SO appropriate that your beautiful art is featured in it! (I have it in my wish list at Amazon ~.~) Thank you for the lovely post. such a great selection! I'll like to see exhibitions of all these artist!!! 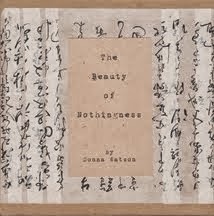 THanks for turning us all onto this book,,,and the other artists..lots of wonderful inspiration...marvelous!!! Thanks! I had been "eye-ing" that book on your sidebar. What a gift to collect such artists together--a lovely group (will have to come back and visit their blogs)! Keeping in my mind now a question, what art would you choose if you were curating such a book, too. You are attracted to such a harmony. Its still such a wonder that comes over me when i look at your recommended Horiuchi's work; i stare and feel and then come to such peace. "A stream sweeps small stones, chanting " ..
evokes so much in me. Man oh man! I need more time! Such beautiful collages. My copy is late getting here so its a treat to see who else is featured in the book. Glad to see Janet Jones' work is included. Only 40 artists chosen and you are one of them....Wow! Well done Donna. I was already looking forward to thus book but now even more so. I am familiar with some of these artists and cannot wait to explore the links of the ones that are new to me. Thanks for sharing. i've ordered it...a lovely treat for when i return home from the States! Donna, just bought the book from Amazon. I can't wait to see it. It looks wonderful and inspirational. And you certainly deserve to be featured in it. You're the best. Hi Donna, Congratulations for being part of what looks to be a wonderful book!Thank you for sharing some of the other artists work. All of the work is wonderful, but I'm very partial to yours. I am looking forward to getting the book, Donna. 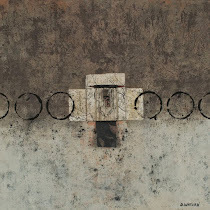 As a painter, I am very interested in collage, but have not moved in that direction thus far. The quotes are certainly inspirational. Congratulations on being in such an important book. The little excerpts that you've shared are excellent. I loved Jones' and Printz' methods. Sounds like fun to try. What a marvelous treat of a post! Your collage is fabulous! Can't wait to get the Masters Collage book. I am really liking what Lark Publishing puts out. 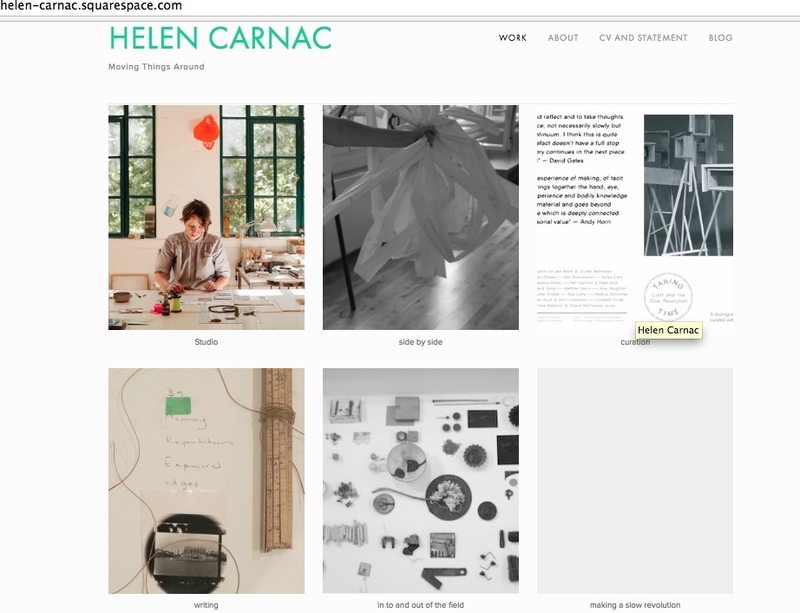 I am savoring the time I will spend on the artists blogs & websites. The collages are just a feast for the eye. Thanks so much for sharing. 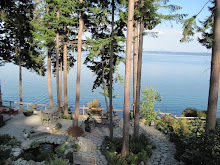 Hi Donna, I found your blog through Leslie's--I'm so glad that I did--I'm a new fan. Thank you for this wonderful post on what looks to be a fabulous book, which I shall have to get, and congratulations on the inclusion of your beautiful work....which I enjoy so much! Wonderful in every way...deep congratulations on your elegant beauty being shared. Congratulations! This looks like a wonderful book! 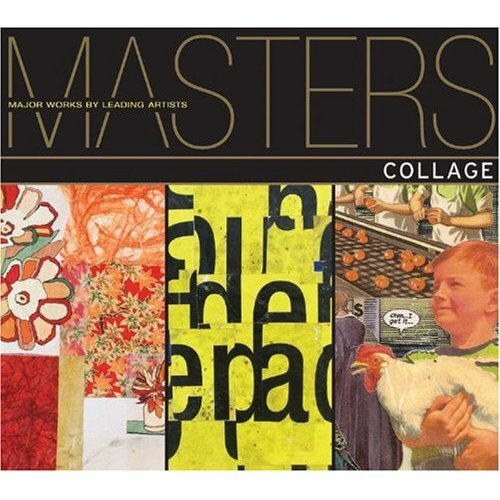 I'm looking forward to my copy of Master's of Collage arriving shortly. Amazon just sent an email and the book has been shipped! Congratulations Donna. You are indeed a Master of Collage! And a beutiful website !! Thank you for sharing this on your blog ! this book looks absolutely divine and i cannot wait to receive it!! i pre-ordered it earlier this year along with another book, and because they were holding the only book until this came out in june, i had to cancel and re-order. can't wait to get my copy! My book arrived yesterday. Simply wonderful and your work makes it complete. another lovely post. 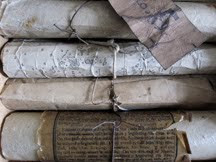 even though i have the book you made me see the work anew. I will get the book! Très belle découverte d'artistes que je n'avais pas l'honneur de connaitre.